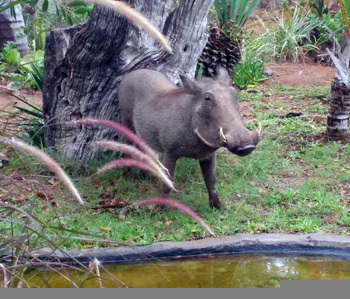 The Warthog, Phacochoerus Africanus, is now as common and as entertaining a visitor to the Tremisana Lodge gardens as the monkey troop. Perhaps they are even more welcome as warthogs do not bother guests at breakfast time, trying to steal food. We have replaced the small yoghurts with larger volume containers as we were sick and tired of seeing plastic containers up trees and all over the veld – courtesy of littering monkeys. The warthog is so named because of the protuberances that grow on the sides of the face. Females have one pair whereas males have two. Typically a sounder consists of father, mother and up to 4 young, all of whom are constantly playing and chasing one another around – great entertainment for all. These reports are published in the order in which they are received. I have had some FANTASTIC bush walks with Raymond – we get our guests very interested in the medicinal uses of plants; we let them spit the impala dung ; we get them into tracks and signs. On one bushwalk we managed to view one of the biggest crocodiles I’ve seen in my life – I reckon it was probably about 6 metres long and it looked like it was out of a Jurassic Park movie. We had a bunch of lucky guests that I had the pleasure to take for their last drive with us. With a beautiful morning sunrise, we were radio called to view lions. So we had a little bit of a « Ferrari Safari » to go there. Once there, we were spoilt: the morning light was perfect and made it priceless for our guests as we were the one and only open vehicle on the sighting. Our sightings have been crazy this past month – I go out with my guests a little later than normal due to a later lunch. As we started the drive we found the lions in an more open area that in the morning, viewed them for a little while and carried on to Rome 1 Eastern Cutline where we saw some elephants. On the way back we had what I call a « Giraffidea » – we saw close to 20 giraffes very close to the vehicle. The guests were very satisfied with their afternoon drive. Another afternoon drive « Doris » ( my cruiser ), on our way back to the lodge we had an unplanned encounter with lions – the Thakazile Pride which consists of 2 females, 5 youngsters and 1 new male. They were all lying down on the side of the road. We then called it in on the radio so everybody could come and have a look. The sun was setting and the guests had a once in a lifetime memory as one of the young males came to challenge us. I raise my voice a little and he moved back. It was such an amazing experience ! We are always happy to share our knowledge and be the first ones to introduce our guests to our life – the bush life. On one sunset game drive, we passed the Spruit and saw 2 « Dagga Boy » buffalos and right next to them a female black rhino and her calf. She came checking us out and even gave us a little charge. Her head was raised up and she start stamping on the same spot and then she charged. I hit the metallic door and raised my voice. She then turned around with a curled tail up. The guests were very impressed. Impressive shot of Black Rhino. We carried on with our drive and viewed mating lions. Everybody felt special to experience such a nice welcome in the bush. On a bushwalk one morning on Marula road we saw Impalas, Black-Backed Jackal and some warthogs. Then there was a beautiful Pride of lions relaxing in the early morning sun – they had dry blood on their faces showing they had eaten something. Pride of lions on the road near Tremisana Lodge. 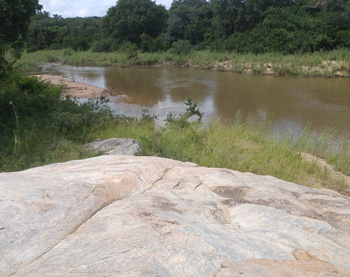 We continued with the bushwalk and encountered some Hippos and four crocodiles. We also heard the Trumpeter Hornbill calling and viewed him and his partner. We also spotted grey duiker and steenbuck. At Barnards I went to Ingwenya dam and there was a big bull Elephant standing in the shade relaxing. What a drive ! The sightings have improved as the weeks have passed. With the nights and mornings cooling down, the intense heat has been broken. 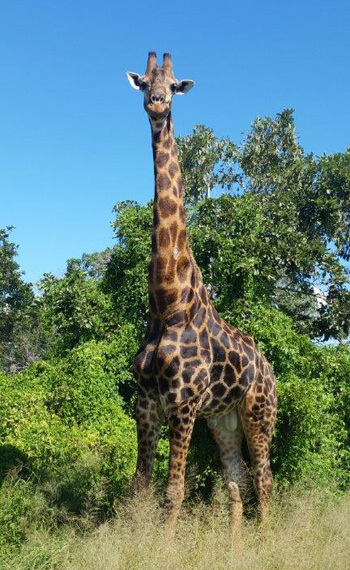 This has resulted in the animals being more active with some special sightings including Zebra jostling for dominance, Giraffe fighting and Buffalo mating. Giraffe looking at us after fight. The scenery is stunning with everything green and lush and birds calling everywhere with plenty of plains game to enjoy. I have had a few amazing lion sightings including two lionesses walking past the game viewer. On the S41 we had the pride of 14 lions with a white female walk past us. The last few sightings where mostly males with four big males relaxing right next to the road. In terms of Elephants we have had big herds crossing the road in front of us and bulls also partaking in dominance displays. 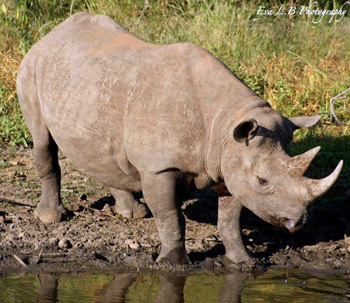 The herds of Buffalo have returned to the Satara area as well as the endangered Rhino. Wild dogs and leopards were often seen this month with a female leopard operating regularly around the Orpen Gate area. At Katekani lodge we have had amazing people visit us from different ends of the earth to see our beautiful heritage. Two people who made an impression on my life where Jan and Layla – they stayed with us for 8 days becoming part of the Katekani family. They enjoyed Kruger, the Rehab centre. The African bush left an impression on both of them. 3rd March : Kruger is difficult these days because of the long grass and thick bushes, water all over. Lions at Orpen, elephants all over, white rhino after Tamboti camp, buffalos after S36, leopard on the main road befor Nsemani dam, lots birds because summer introduces lots of insects and flies. 9th : Lions before Nsemani dam lying down, elephants all over, buffalos Ngirivana road S12,leopard S125 and rhino on our way out. 15th : Leopard Orpen gate, rhino in an open area , lions on S36 road, elephants all over a one dagga boy after Nwamatsatsa bridge. 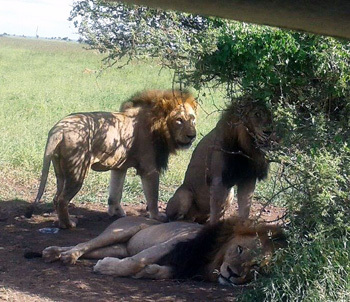 3 male lions near Satara. 21st : Lions before Nsemani dam, elephants all over, leopard S125 road and more lions at Talamati road with a buffalo kill. 26th : Lions after S36 with zebra kill, lions lying down at Nsemani dam, leopard on S125 , four rhinos near bridge on H7 road and buffaloes on S12 road. We went on a bush walk along the river and we saw one bull elephant feeding on a Marula tree. Because of the wind he couldn’t smell us yet we were able to smell him. The guests were very excited ! We went on further and saw waterbucks, hippos, crocodile, African Fish Eagle and impalas. We really had a great time ! We did the afternoon drive along Marula road where we saw impalas, black-backed jackals and giraffes and when we reached Sable road we saw a big herd of elephants. A young male come close to the Cruiser so I told him to back off and he obeyed – it was amazing : the guests couldn’t believe how we operate – we had a great time. Our sunset drive was brilliant because we come across the lions on Campfire, one male and seven females. We stayed there so that the guests had enough time with them, After this we drove to Sable road and we saw 4 Wild Dogs on the move. We drove down to Rome 1 and we saw the black rhinos surprise surprise, it was an excellent drive just before marula boma and when we arrived there at the boma the guests were very excited to see the candlelight and the fire. 3rd March: Lions on the as well as elephants. Breeding herd of buffalos on the H-7, a leopard on the riverbed. Four rhinos before reception. 13th: 2 lions before Phelwane bridge on the H-7 , two sightings of leopard on the S140 next to Nsemani dam. 15th: Pride of the lions crossing the road near Orpen, elephants before Nsemani also crossing the rhinos on Rabelais, buffalos all over. 18th: Lions under the tree on S41 towards Nwanetsi S127 Rhino, Buffalo and Elephants. 26th: Before the Orpen reception a leopard kill in the tree, hyenas. S125 pride of lions in the river bed. 17th : On Rome 1 on a bush walk we found a big breeding herd of elephant. 22nd : 7km before Orpen we found a leopard on a marula tree, two white rhinos crossing the road, elephant in musth and more than 150 buffaloes. 23rd : On S41 we find 2 cheetahs about 4 km from Nwanetsi hunting. 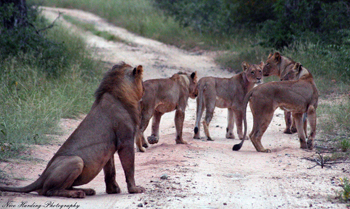 25th : We found a pride of 10 lions near Satara, the cubs play with one another. 27th : On Balule near Tremisana Lodge we found the pride of 7 lions. 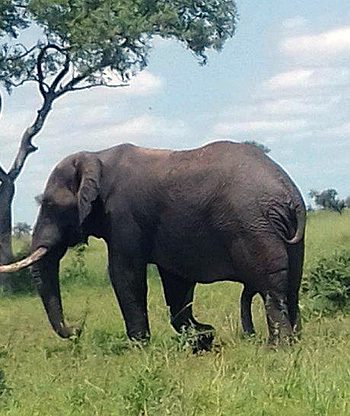 28th : On Marula Road, we found 2 big elephants with two young. Walked right next to vehicle – we could have touched them ! The month of March has been good for me both on the Bushwalk side at Balule and drives in Kruger. Near Tremisana Lodge, along Marula road there has been a big pride of lions hunting along that road several times this month. Along the Olifants River we are always guaranteed to see crocs and hippos as well as elephants. Kruger Park has been amazing too with a male leopard near Talamati. We really enjoyed the beauty of this cat as he walked right next to my game viewer. Beautiful shot of a beautiful cat. Lions brought down a buffalo on the same road right on the road. The pride was bit divided as all the young males were pushed away to feed later while the big males with dark manes took over the carcass. Hippo & crocodile along the Olifants River and usually on the way back from bushwalks, 2 bull elephants. The pride of 8 lions has been seen fairly regularly. On another bushwalk we found 6 hippos and 8 giraffes on the river bank. Drives on Marula road have been productive : we have seen elephants and giraffes as well as Black Rhino. 3 black rhinos have been seen on Rome 1 and 4 bull elephants. We are seeing elephants 2 black rhinos regularly. There is also a herd of 4 White rhinos. We have found a new male lion with a black mane that has not been seen before. 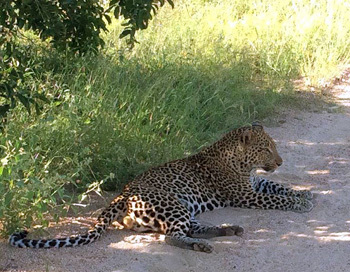 A female leopard on impala boss west has been seen from time to time. 2 lionesses have been seen at Tremisana dam drinking water. Katekani Tented Lodge will have its final two units completed by 1 May 2017. All of the 8 units will be named after the trees that are included in the deck. Tremisana Lodge has had an impressive face lift. We will be adding new furniture in early April. Two new thatch umbrellas at Tremisana pool. Marc’s Treehouse Lodge has had some good rains earlier in the month and the grazing here is far superior to that at Tremisana. Klaserie River at Marc’s Treehouse Lodge. Masango Lodge will be opened to self drive guests. 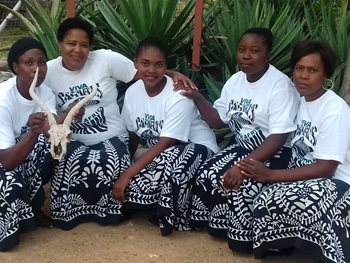 We have encountered complications as a result of bureaucratic issues related to our Manyeleti experience. We regret that our well-intentioned efforts to allow the local communities to benefit through Viva Safaris will not bear fruit in the immediate future. All 6 day safari participants will spend 2 full days in Kruger Park. Tremisana’s lovely ladies at the front gate. Stayed here for a few nights and it was really wonderful. All the staff were great and so friendly and helpful. The lodgings were clean and comfortable. The food was lovely. Rex and Elias were SO KNOWLEDGABLE it made for a great experience. Robin and Eva also really helpful with all the answers to our questions. Pretty couldn’t have been more accommodating to us. I think considering we were in the bush it couldn’t have been a more inviting and accommodating place!!! Can’t wait to recommend to our friends! Absolutely enjoyed the Safari! I spent 5 days there: the stuff is very friendly and the guides know a lot so you will learn many things about the African bush. Huge change to see all Big Five and watch the animals in their natural habitat. A Safari is an experience which will take your breath away. We recently stayed for 4 nights at Katekani Tented Lodge. It was fantastic with attention to our dietary requirements, tasty food, seated at night around a fire, the rooms were huge with sleeping area, lounge, inside and outside showers, deep tub, 2 sinks and separate toilet room. We saw bushbuck from the deck which has a plunge pool and recliners, table, etc. This lodge is about a year old with a new tented building under construction. 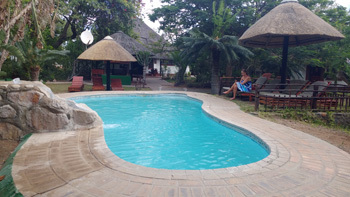 This is ideal if you want a small bush lodge experience but comfort. 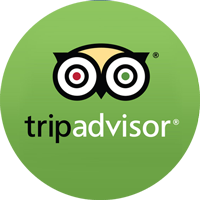 Our tours were very high quality and recommended. Room Tip: There are currently 6 tented suites in 3 buildings. All are a good location. Heather and Mark, Great Britain. The communication from the start was great, with a lovely lady called Rochelle, if I had an enquiry about the booking she would respond quickly and no longer than within 12-24 hours. The Safari- The structure of the days were planned very well, and there was a good mix of game reserves and Kruger. All guides with Viva safaris were fantastic and stayed professional. Nico was great, very knowledgeable and so enthusiastic, he made us laugh. Victor who worked at Marc’s Treehouse Lodge who we didn’t see that often but when we did he was always smiling, very happy chap and had some great stories to tell on our bush walk. What I will say is on the final day instead of the bush walk, one last early morning game drive pups have finished it off perfectly before the drive back to Johannesburg. As the travelling days are classed as Safari days. This trip was for our honeymoon and it was certainly one to remember!! Katekani Lodge where we stayed for 2 night following our lodge at Tremisana was just incredible (review left on TripAdvisor) everything about it was amazing, from the staff to the area, the comfort of rooms, the food with our own chef! Couldn’t have wish for a better honeymoon but just wished we had longer! A huge thank you to all of the Viva Safari team, we hope to visit again in the future.